Survey and ground control operations are currently in progress in western Mauritania where an outbreak developed in early November as a result of unusually good rains in September and October. One generation of breeding has occurred and hoppers formed small groups and bands. Many of these hoppers have fledged and the new adults formed small groups that are currently becoming mature. Consequently, a second generation of breeding is expected to commence from about mid-December onwards. 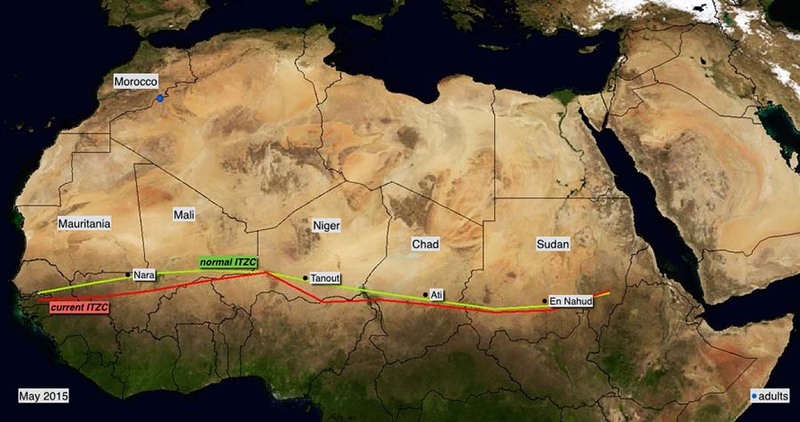 The outbreak is confined to an area east of Nouakchott but it could extend further north into northwest and northern Mauritania and adjacent areas of Western Sahara and western Algeria that received very heavy rains in September and October. So far, teams have treated nearly 3,000 ha in Mauritania. Elsewhere, small-scale breeding is in progress in the Air Mountains of northern Niger, scattered adults were seen in northern Mali, and low numbers of adults appeared in winter areas along the Red Sea coast in Sudan, Saudi Arabia and Yemen. Small-scale breeding will cause locust numbers to increase in these areas as well as on the coast of Eritrea. In southern Yemen, there is a risk of locust breeding for the next 4-6 months in areas where heavy rains fell from two tropical cyclones last month. Small-scale breeding is also expected in northern Somalia where good rains also fell from cyclone Megh. More rain may fall due to El Nino. The current Desert Locust situation remains calm. Late summer breeding is in progress in northern Niger and breeding is underway in northwest Mauritania. Low numbers of locusts persist in northeast Chad and in the interior of Sudan. During November, small-scale breeding will cause locust numbers to increase in northwest Mauritania and is likely to extend to areas that received heavy rains. Low numbers of locusts will appear along both sides of the Red Sea and also breed on a small scale. There have been several significant events recently that will require regular monitoring and vigilance during the next six months in a number of locust-affected countries. 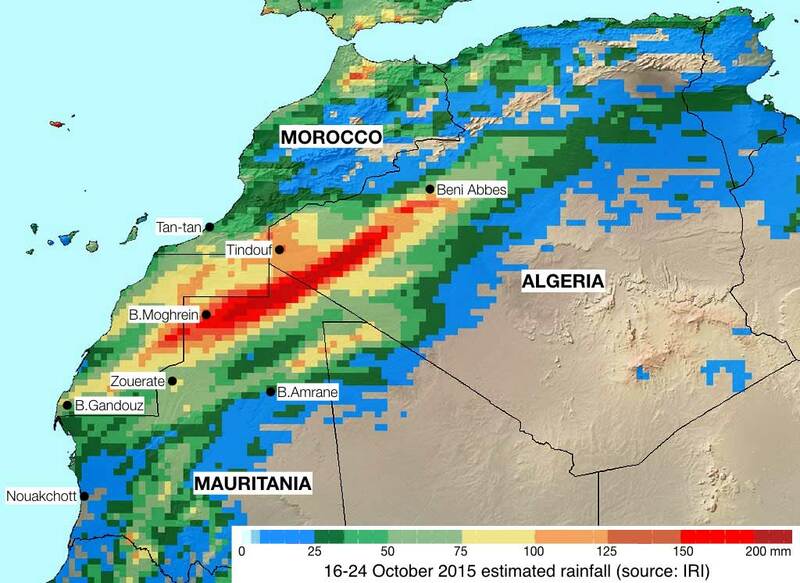 In Northwest Africa, unusually heavy rains fell over a widespread area of northern Mauritania, including the northwest of the country as well as adjacent areas of Western Sahara, southern Morocco and western Algeria between 15 and 25 October. Many places received several times more rain than usually falls during the entire year. As a result, ecological conditions are likely to remain favourable for Desert Locust breeding and survival for at least the next six months, even in the absence of further rainfall. 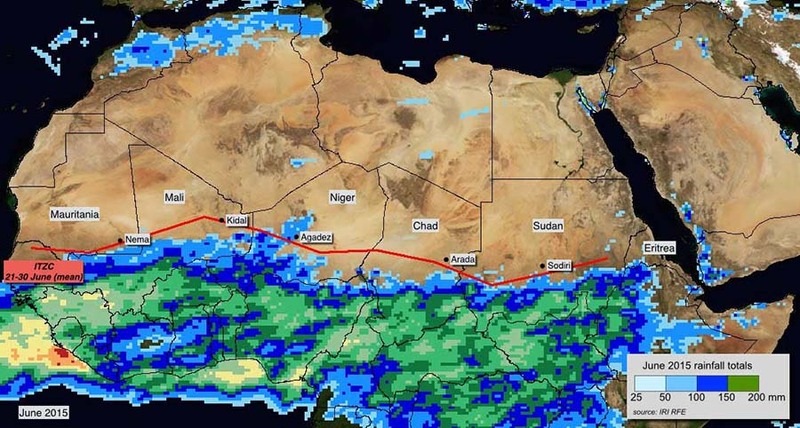 In addition, good rains also fell in southwest Libya. In the Arabian Peninsula, heavy rains associated with tropical cyclone Chapala fell in southern coastal and interior areas of Yemen on 2-3 November. The torrential rains which far exceeded the annual average rainfall for the entire year caused flooding and damage. As a result, ecological conditions are likely to become favourable for locusts and remain so until at least next spring. In the Horn of Africa, above-average rains associated with a very strong El Nino are predicted to fall over northern Somalia during this winter and next spring. If so, ecological conditions will become favourable for breeding on the northwest coast and the Somali plateau. In the winter breeding areas along both sides of the Red Sea, seasonal rains commenced in early October, which is slightly earlier than normal. As a result, ecological conditions will become favourable for breeding in coastal areas of Sudan, northern Eritrea, southeast Egypt, Saudi Arabia and Yemen and, if the rains continue, there would be sufficient time for two generations of breeding to occur this year. Unusually heavy and widespread rains have fallen during several days between 15 and 24 October throughout the Tiris-Zemmour region in northern Mauritania from Zouerate to Bir Moghrein and Bir Amrane, extending into western Algeria (Tindouf to Beni Abbes) as well as southern Morocco and Western Sahara (Bir Gandouz to Tan-tan). In many places, rains far exceeded the total amount that is normally received for the entire year. For example, Bir Moghrein reported 120 mm on 21-23 October; whereas, normally only about 45 mm fallsfor the entire year (the October long-term average is 11 mm). Good rains also fell recently in parts of northwest and western Mauritania. As a result of these exceptional rains, ecological conditions are likely to remain favourable for Desert Locust breeding and survival for at least the next six months, even in the absence of further rainfall. Low temperatures will initially delay the appearance of some annual vegetation but, thereafter, it should stay green until temperatures warm up in about April. Thereafter, vegetation is likely to start drying out, especially in the absence of any further rains. Similarly, low temperatures will length egg incubation to at least three weeks and hopper development rates to at least two months. Nevertheless, there is sufficient time for two generations of breeding to occur between November 2015 and May 2016. In this case, a significant increase (some 500-fold) in locust numbers could be expected. Concerned countries are urged to be vigilant and monitor the situation on a regular basis between November 2015 and May 2016 in order to detect any signs of increasing locusts. The current Desert Locust situation remains calm but there is reason for caution. It appears that the persistent good rains over the northern Sahel of West Africa have nearly ended. Despite the widespread rains and the favourable ecological conditions that ensued, very little breeding was detected by surveys carried out in Mauritania, Niger and Chad during September. Nevertheless, locust numbers gradually increased and there may be more locusts present than reported. Consequently, once vegetation begins to dry out, there is a low to moderate risk that locusts may concentration and form a few small groups in parts of Mauritania, Mali, Niger, Chad and Sudan during October. There will also be a gradual shift of locusts from southern to northwest Mauritania, from northern Mali and Niger to southern Algeria, and from the interior of Sudan to the winter breeding areas along the Red Sea coast. Good rains have already fallen on the coast of Eritrea and in some areas of Yemen and Saudi Arabia that could lead to early breeding. Therefore, caution should be exercised and strict vigilance maintained in all countries during October and November. In Southwest Asia, low numbers of adults were present in Pakistan along the border with India. As the monsoon rains have ended, no significant developments are expected. The Desert Locust situation continues to remain calm in all frontline countries. Low numbers of solitarious adults are present in a few places of the summer breeding areas in southern Mauritania, northern Niger, Chad and in Sudan. Surveys are not possible in northern Mali due to insecurity. Isolated adults were seen in southern Egypt and near the India border in Cholistan, Pakistan. Good rains that fell over a widespread area of the northern Sahel during July and August have caused ecological conditions to become favourable in most areas between Mauritania and western Eritrea. Consequently, small-scale breeding will cause locust numbers to increase in these places during September. Regular surveys should be undertaken in all areas to monitor the situation closely and detect the first signs of population increase. The Desert Locust situation continues to remain calm in all frontline countries. No locusts were present except for low numbers of solitarious adults in northern Sudan during July. By the end of July, good rains had fallen throughout most of the summer breeding areas in the northern Sahel between Mauritania and Eritrea. Consequently, small-scale breeding during the forecast period will cause locust numbers to increase slightly in all countries. Unusually heavy and widespread rains fell in the summer breeding areas along both sides of the Indo-Pakistan border and may give rise to favourable conditions sufficient for two generations of breeding. Intensive monitoring should be carried out in both countries in the coming months to detect increases in locust numbers. Good rains and at least two generations of breeding will be required this summer before populations increase in the traditional summer breeding areas in the northern Sahel of West Africa and Sudan, and along both sides of the Indo-Pakistan border. So far, rains are late to arrive in the Sahel, except in central Niger and eastern Mali, while monsoon rains commenced some one to three weeks earlier than normal in India and Pakistan. Once the summer rains start, small-scale breeding will occur in the northern Sahel between Mauritania and western Eritrea. Therefore, regular surveys should commence shortly in all summer breeding areas but some places such as northern Mali, Darfur and the interior of Yemen will remain inaccessible due to insecurity. No significant breeding occurred this year in the spring breeding areas of Northwest Africa, the Arabian Peninsula and Southwest Asia where vegetation continues to dry out. During the next six weeks, low numbers of solitarious adults are likely to appear in parts of the vast summer breeding areas in the northern Sahel, stretching from Mauritania to western Eritrea as well as along both sides of the Indo-Pakistan border. Small-scale breeding will occur with the onset of the seasonal rains but locust numbers will initially remain low. Summer rains may be delayed or weak in the northern Sahel this year. Regular surveys should commence shortly in all summer breeding areas but some places such as northern Mali, Darfur and the interior of Yemen remain inaccessible due to insecurity. The Desert Locust situation continued to improve during April. Very little rain fell throughout the recession area. 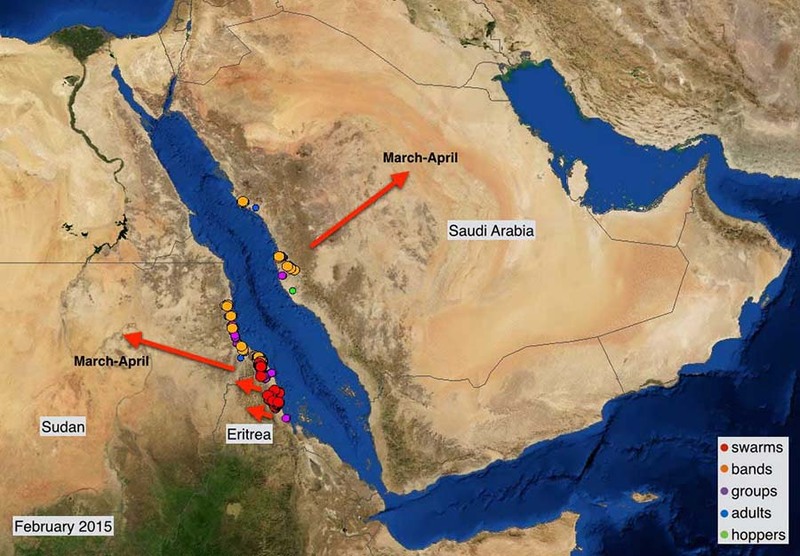 Only low numbers of solitarious adults remained in a few places of the winter breeding areas along both sides of the Red Sea in Sudan and Saudi Arabia. A few adults moved into the interior of northern Sudan. No control operations were conducted in April. Scattered adults were present in southeast Iran and isolated adults were seen in the central Sahara in Algeria. During May, small-scale breeding may occur in parts of the spring breeding areas in the interior of Saudi Arabia and in parts of Northwest Africa. Locust numbers will remain low and no significant developments are expected. The Desert Locust situation improved during March in the winter breeding areas along both sides of the Red Sea due to ongoing control operations and drying ecological conditions. Nevertheless, a few adult groups and swarms formed in Sudan and Eritrea, and there remains a risk that some of these may move into the Nile Valley in northern Sudan and breed near irrigated cropping areas. Very few locusts were reported in other regions. During the forecast period, small-scale breeding is likely to cause locust numbers to increase slightly in the spring breeding areas of Northwest Africa, the interior of the Arabian Peninsula, and in southeast Iran and southwest Pakistan as a result of good rains that fell in March. Desert Locust adults are forming numerous groups along the Red Sea coastal plains on both sides of the Sudan and Eritrea border where two generations of breeding occurred this winter. Numerous immature swarms formed further south on the central coastal plains of Eritrea and a few swarms moved inland towards the highlands. Control operations are in progress in both countries, including intensive aerial operations in Sudan. In the absence of further rains, winter breeding has nearly ended in Sudan and Eritrea. As vegetation dries out, adult groups and swarms are expected to move north along the coast into Sudan during March and then inland towards the Nile Valley in Northern and River Nile States. Small swarms may also move into the Highlands of Eritrea. 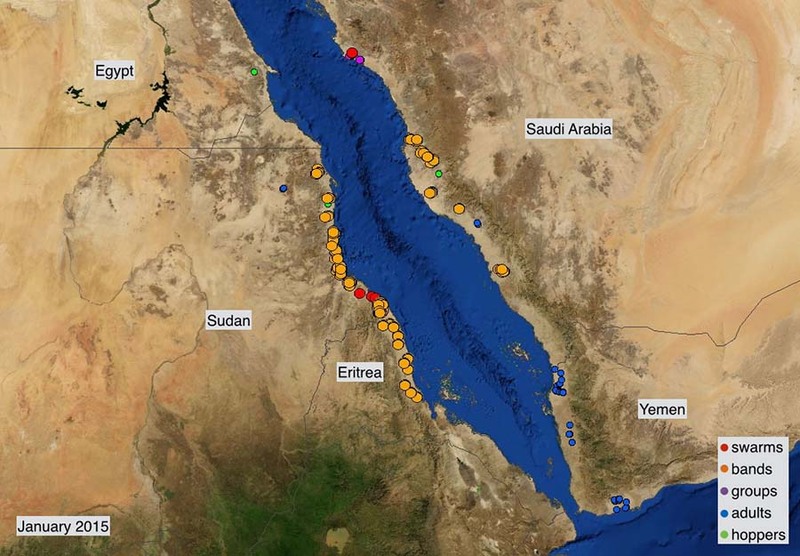 Smaller-scale aerial and ground operations were conducted on the central Red Sea coast of Saudi Arabia against hopper bands and adult groups in February. Locusts escaping detection or control are likely to move into the spring breeding areas of the interior in March and April. The locust situation remains calm elsewhere. During March, low numbers of adults are likely to appear in parts of the spring breeding areas in Northwest Africa and Southwest Asia. As temperatures warm up and if rain falls, small-scale breeding is likely to occur south of the Atlas Mountains in Morocco and Algeria, in northern Western Sahara, and in coastal and interior areas of southeast Iran and southwest Pakistan. Desert Locust infestations increased during January along both sides of the Red Sea as a result of a second generation of winter breeding. Control operations intensified against numerous small hopper bands that formed in Sudan, Eritrea and Saudi Arabia. Although there were signs the situation was improving in Sudan due to control operations and drying vegetation, significant infestations remain in Eritrea where vegetation is usually green and more hopper bands, groups of adults and perhaps a few small swarms are expected to form in February. Once vegetation starts to dry out, there is an increased risk that those locusts which escape detection or control could form adult groups and a few small swarms and eventually move to the Eritrean Highlands and the interior of northern Sudan and Saudi Arabia. If locusts reach the interior of Saudi Arabia and the Nile Valley in northern Sudan, breeding could commence in March. Elsewhere, low numbers of adults were present on the Red Sea and Gulf of Aden coastal plains in Yemen. The situation remains calm in West and Northwest Africa and in Southwest Asia. Desert Locust outbreaks are in progress on the Red Sea coast in Sudan and Eritrea where control operations continue against ongoing breeding. In Sudan, ground and aerial control operations treated nearly 12,000 ha in December. Fledging will commence about mid-January and, thereafter, an increasing number of adult groups and swarms could form. If conditions remain favourable, there is a risk of another generation of breeding. In Eritrea, first-generation breeding continued on the Red Sea coast where more hopper bands formed as well as adult groups and a few swarms. A second generation of breeding commenced at the end of December that will cause locust numbers to increase further with new hopper bands in January and swarms forming by mid-February. Ground teams treated 4,000 ha in December. 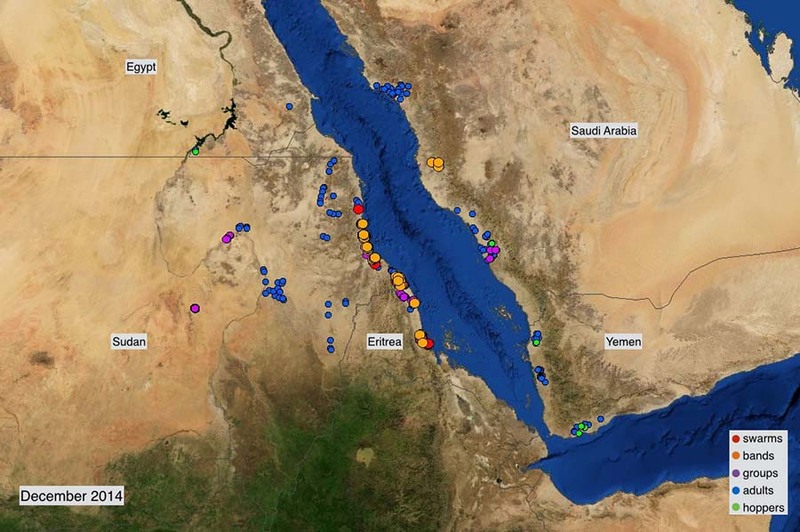 Breeding on a smaller scale is in progress on the Red Sea coast in Saudi Arabia and Yemen. Limited control operations were carried out near Mecca against a few small hopper bands. Locust numbers will increase in both countries during January as a result of breeding and further hatching. Hopper bands and a few small swarms could form in Saudi Arabia. Elsewhere, the situation remains calm.